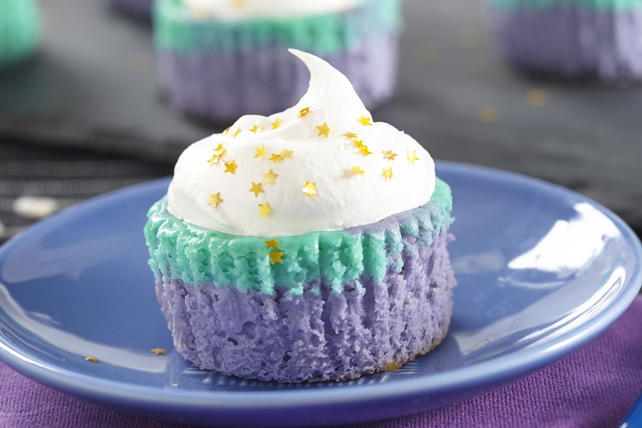 In celebration of the great “Total Eclipse of the Sun” yesterday, Kraft offered these gorgeous mini cheescakes on their recipe site. They’re pretty and I suspect they are pretty tasty. You could also use different colors of food color gel for different celebrations. I haven’t made these but…pretty. And almost bite-sized cheesecake. Yum! Kraft has this to say about these little yummies: The buzz about our Galaxy Mini Cheesecakes is that they’re simple, quick and delicious. What more could you ask from a dessert? Beat cream cheese, sugar and vanilla in medium bowl with mixer until blended. Add eggs, 1 at a time, mixing on low speed after each just until blended. Pour half the batter into separate bowl. Add blue food coloring to batter in one bowl and violet coloring to the remaining batter. Place 1 cookie in each of 12 paper-lined muffin cups; cover with violet-colored batter. Top with small spoonfuls of blue batter; swirl gently with knife. Bake 20 min. or until centers are almost set. Cool in pan 10 min. Remove to wire racks; cool completely. Top with COOL WHIP and sprinkles just before serving. This dessert is sort of a grown-up version of a fancy cupcake–only cheesy goodness instead of cake. I’ve been reviewing my heroines to see who would have this recipe in their box and it came to me. Georgie from THE BOSS AND HIS COWGIRL. While she was raised on a ranch, she’s also spent a lot of time in Washington D.C. and would collect the kind of recipes that would taste great and look beautiful on a party table. I can totally see Georgie making these.